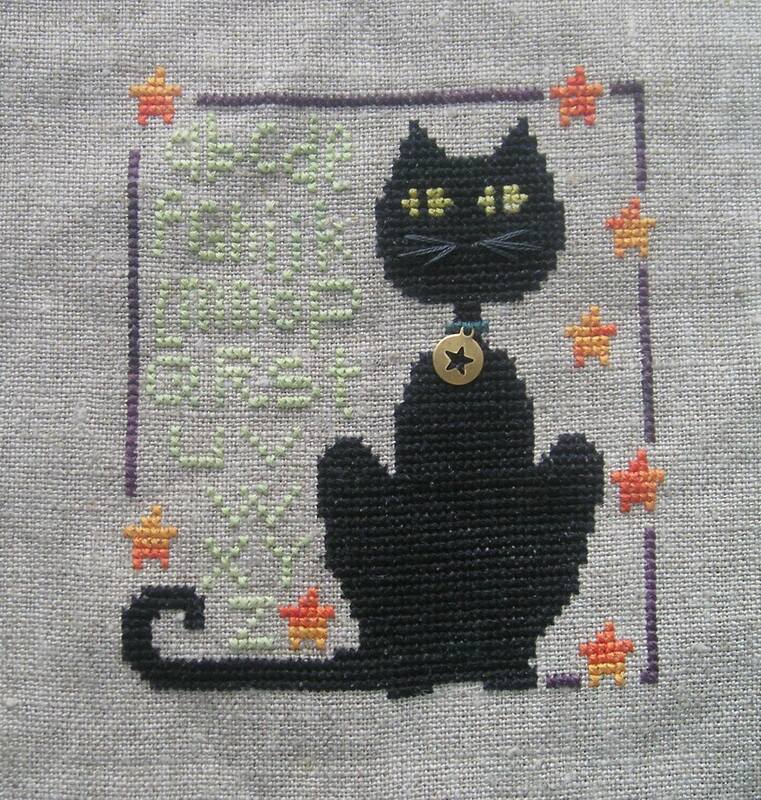 My August Smalls Challenge 2014 entry is this little cutie by The Trilogy, called “Happy Black Black Cat Day.” I actually finished this one on time (August 30th), but then I procrastinated for a week before posting it on this site (and, by extension, the Smalls Challenge site) today. Even when I’m on time, I’m not on time. I thought I was working on 32-count natural linen, but it turns out it was 28-count, so the whole design is a bit larger than I expected. I also messed up and the cat is actually one row longer than it’s supposed to be (and one row higher in the lower half, which necessitated redesigning the “Z” in the alphabet and the orange star next to it). My eyes are getting too old for this kind of stitching, I’m afraid. As a result, the design is a bit more rectangular than it was originally supposed to be. I also made some deliberate modifications in the design. Instead of the colors called for, I used Gentle Art Sampler Threads “Cornhusk” for the cat’s eyes, “Green Apple” for the alphabet, and “Brethren Blue” for the collar. I used Weeks Dye Works “Mulberry” for the purple lined edging, “Autumn Leaves” for the orange stars, and “Mascara” for the cat (it used an entire skein plus a little bit where I supplemented by using one strand of “Mascara” with one strand of virtually indistinguishable DMC 310). I also added some whiskers in DMC 3799, and left out two of the tiny star charms. This is sooooooo not a “small” design, even though it’s less than 90 X 70 stitches. I don’t know what I was thinking! It’s been awhile since I’ve done a sampler, and I thought it would go quicker than it has. 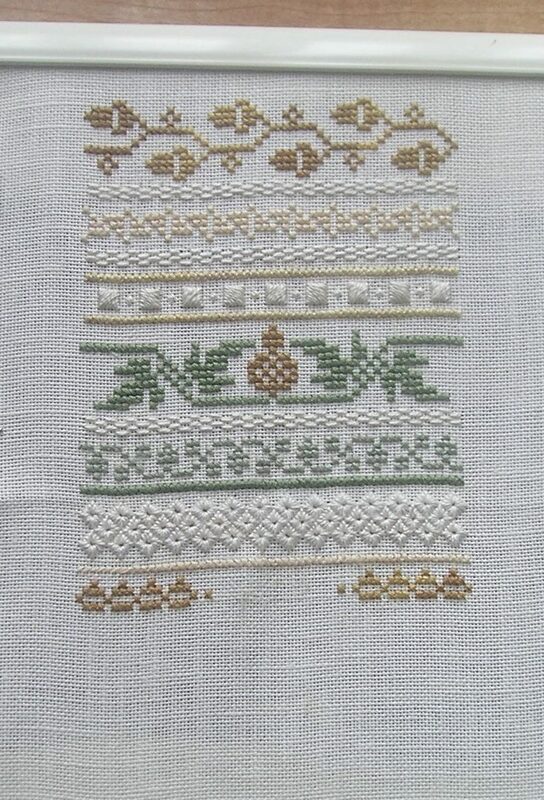 I can also tell a huge difference in the quality of my eyesight since the last time I worked on a sampler like this that requires such tiny, precise stitches. For example, the line I’m currently working on is supposed to have the word “acorns” in the center done in one-over-one stitching. I’ve already had to frog it twice today. Blurgh. I think I’m going to set this one aside for awhile. I’ve already decided that I’m going to do something quite small for September. It’s important to set realistic stitching goals. Giveaway: If you’d like my gently used copy of “Happy Black Black Cat Day” with two of the small star charms included, leave a comment below letting me know. It sounds like you have to join us old farts in wearing our double glasses! I chose a tiny over one project for the Small SAL and couldn’t manage to get that one done myself. As for fancy sampler stitches, that’s what’s slowing me down on my MIL’s (August) birthday present. Sigh. What has become of us? Yes, we’re going to pot. I hadn’t been focusing on cross stitch as much lately, so when I went back to it after that absence, I could *really* notice the difference. And I love fancy sampler stitches! I’m going to have to do something about my glasses. Sigh.